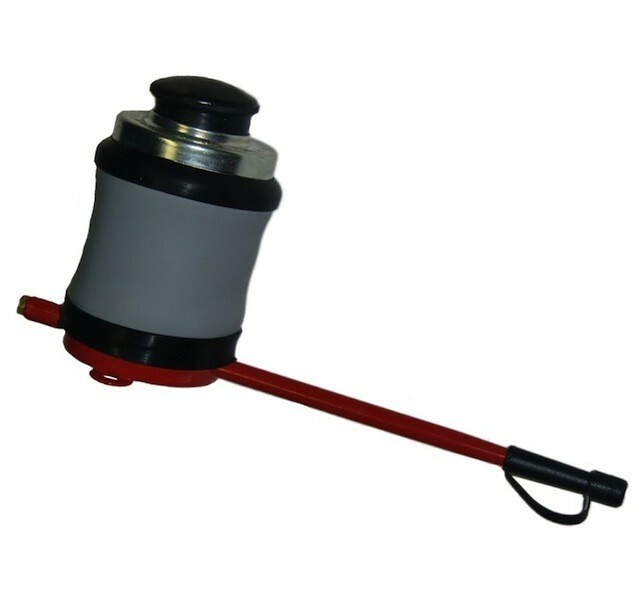 PRODUCT DESCRIPTION: Bellows type of duster which allows you to apply dust to plants, vegetables, foliage, etc. with accuracy and uniform flow so you don't over apply it or waste material. This model comes in two styles; the standard model seen to the right has a 6" extension and is good for most applications. But in some cases, you may need the longer reaching model which features a 12" extension. This is our Crusader, which works just like the CB4, but has a larger bulb for holding more dust. This Duster is better suited for larger jobs where you need some type of extension for reaching under or into tight spaces. It features a rubber bulb and a metal extension and tip. Use it for products like Drione, Deltamethrin Dust, DE Dust, etc. The video below does a good job of showing how it's used. Purchased and used with Drione Dust to handle carpenter bees. This duster is simple and appears to be high quality. 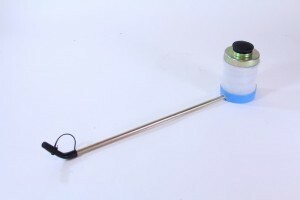 Includes a tube clearing rod, which I did not need, and the bellow mechanism is easy to operate. I dusted 19 carpenter bee holes and corked them. Simple. Good quality. I've used this bellows duster to spread about a pound of Drione dust. It seems to be well made and functions well. The nozzle is ideal for getting into cracks. Be advised that it came with no instructions. It took me a few minutes to realize it should be held with the rubber stopper on top. Also, there's a small brass bolt that screws into the bottom of the tube, opposite the business end. I guess it's to allow air into the system. I cracked it open a bit, and the unit works fine. Great duster! Works just like in the video, very effective. Easy to use, follow the directions from the video. We did have an issue with the pin falling out during the dusting and did not know were we lost it. Trying to order another pin. Recommend it be included in the duster itself. I'm glad I ordered it because it provides distance from where I am needing to spray large wasp nests. Very well constructed and durable. This duster works very well for blowing Drione into carpenter bee holes, whether upwards, downwards, or sideways. A quick shake to loosen the Drione inside the bellows, then one or two pumps (easily done with one hand) will coat the inside of the hole with white dust. The duster blows the Drione inside the hole very effectively, and not all over the place. I wear a dust mask and eye protection anyway, as a precaution. This product is easy, safe & surprisingly effective. The 'how to use' videos are instructive & accurate. We highly recommend this product to others. We plan to use it to keep wasps from infesting our buildings. Wasps have a place in the world. But, not in the crevices of our buildings. Powerful stuff! Ordered for my dad to deal with wasps nesting inside of vinyl siding of his townhome. It worked very well. The powder is not as fine as I imagined, but still powdery. It is definitely powerful. The tool is very nicely designed and easy to operate. Ordered for my dad to deal with wasps nesting inside of the vinyl siding of his town home. It worked very well. The powder is not as fine as I imagined, but still powdery. It is definitely powerful. The tool is very nicely designed and easy to operate. The 12" extension duster allowed me to keep my distance from the yellow jacket nest in the ground. I was able to apply the drione dust to the surface area of the nest and now….no more yellow jackets! This wand does what it is supposed to do, spray effectively! Powder worked as advertised. Applying the dust at night worked just like the video showed. Much better than hiring an exterminator. I am still getting used to using the duster. I feel the point at end should direct the dust to the side instead of the top. Nevertheless, when I use it correctly, it sure dispenses the right amount and within the right area you need. Very happy with process and guidance give by Bugs Spray staff online. It Works! I used this product and it worked as designed…Just spend your money because you, your family, friends and relatives depend on you keeping them safe when they visit your home. I purchased the 12” extension duster to treat an inground yellow jacket nest. It worked perfectly but I was nervous getting that close to the nest. I took the advice on the you tube video and treated it at night which helped. Killed the nest completely. This Duster made the job so easy, a must have!! Tags: crusader, hand duster, home, powder puffer.